Pu-erh tea is the Champaign of Teas. Pu-erh? What the heck is Pu-erh? I said the same thing when I first saw the tea listed in a tasting class. Let’s first talk about how to pronounce it. Once we get that out-of-the-way we can go on to the wonders of the variety. Most people can get the first half correct – ‘Pu’ is pronounced ‘Pooh’, like Winnie the Pooh. The ‘erh’ seems to trip most people up and for the last two years I have enjoyed watching the tea class students and many tea store owners struggle with the name. I don’t enjoy it to make fun, I smile in ‘solidarity’ as I was in their shoes a couple of years ago. I tried to explain this tea to friends and family and just couldn’t get the name right. How can you sell tea if your can’t even say the name properly? The ‘erh’ part is simply ‘air’ like the air we breath. The name is pronounced as two syllables, first ‘pooh’ – ‘air’. Why do I call Pu-erh the Champaign of teas? It is because of all of the tea varieties, this is a classic black tea, not black tea as we call black tea here in the United States, which is actually called red tea in China – Pu-erh is a ‘true’ black tea. It comes from China, from the province of Yunnan. Of all of the varieties of tea, Pu-erh is the most processed. It under goes an aging process which includes oxidation and fermentation before brewing. Like other teas, Pu-erh starts out as a simple green tea. It is allowed to air dry to remove as much moisture as possible before undergoing pan-frying in large woks. This stops oxidation and halts the enzyme activity within the leaf. The leaves are then rolled and pressed into small groupings and allowed to further air dry. Once dry, the tea is then formed into a variety of shapes known as: cakes, bricks, squares, and melons. Then comes the best part – you wait. And wait, and wait……. Well – that isn’t exactly the last step. Pu-erh undergoes a process of ‘aging’ by stacking and wetting the tea blocks and maintaining them in a humid environment to encourage the bacteria and fungus to ferment the blocks. Yuck! you may be thinking – right? But it is this process that develops the unique flavors and intense aromas found in Pu-erh tea. It is like developing a fine wine or a premium beer. The cakes are aged anywhere from 6 months to a year. 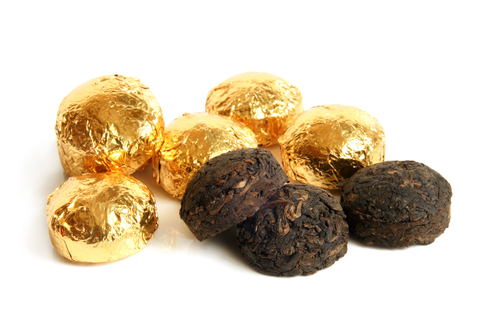 To enjoy your Pu-erh tea, you simply place the tea cake into your favorite tea-pot or break off a piece of the tea cake to brew. The key to enjoying your Pu-erh is proper steeping temperatures and times. Pu-erh is steeped at a lower temperature than most green, oolong, and black teas and is allowed to steep from 12 – 30 seconds. One of the easiest mistakes to make is using water that is too hot and steeping for too long. This will give you a bitter flavor which could ruin the entire tea experience. One benefit is that this tea can be infused several times from one cake. I was not terribly excited to taste this tea the first time. I was worried about the liquor being bitter and I was afraid there would be a strong astringent taste to it. However, I was pleasantly surprised and Pu-erh rose to my favorite tea quickly. At our tasting this year at the World Tea Expo, I was privileged to try Snow Mountain Sheng Puer. It was a beautiful light amber color with a roasted aroma. I like the Pu-erh because they have a smokey flavor – very unique from your standard green and black teas. The flavor is rich and vibrant. Pu-erh is an excellent after dinner tea. Pu-erh is a little pricier than other teas because it is more refined. But, when you factor in the number of infusions possible from one cake, it all works out. Just for reference, one of the most expensive Pu-erh sold was in 2007 for approximately $38,000. The cake was reportedly 60 years old. See – things do get better with age! Anyway, if you are serious about your tea experience, you should not discount a good Pu-erh. This tea is not for everyone, but is an enjoyable variety to include for that special tea time and one to grow into for the true tea connoisseur. Until our next installment for The Magic of Tea: ‘Find Your Zen and Do The Brew’ Everyone tip those tea cups!